All colors in the Crystaltex series are LEAD FREE. CL for CTL-20 Royal Turquoise and CTL-26 Sea Mist only. 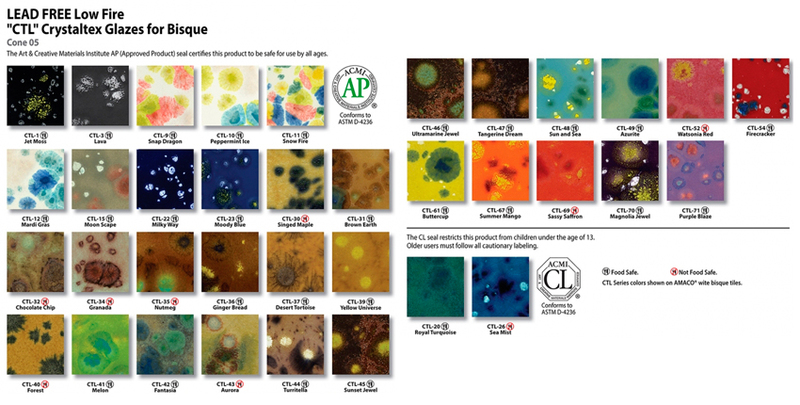 Lesson plan #47 - Celestial Tiles is easy, colorful and uses our Crystaltex glazes! These glazes make great desktop wallpaper for your personal computer! Click here to go to our wallpaper page. Cone 05. AMACO® Crystaltex Glazes are for the potter who dares to try something novel. Multi-color effects can be subtle as with CTL-32, which fires to a creamy yellow peppered with rich brown, or they can be bold like the red, white and blue of CTL-54 Firecracker. No two pieces will ever be alike, but all will be unique. CTL-3, CTL-31, and CTL-41 have a matte finish with glossy crystals when fired. The rest of the series is either glossy or a textured gloss/matte finish. All crystals fire to a gloss finish.